St. Martin's Press, 9780312630775, 384pp. Want to soften your crow’s-feet? Find out which foods will turn back time. Plagued by pimples? Discover the snacks that will erase stubborn blemishes. Did you know milk doesn’t always do a body good? Feel a sunburn coming on? Learn why red wine may save your skin from peeling and flaking. What does a hard-partying rock star eat for good skin? So stop thinking about food in terms of what you can’t have: no butter, no red meat, no fat, and no flavor. Instead, discover the foods that will keep you feeling full and looking gorgeous. Follow the FEED YOUR FACE Diet, and you can have pizza. You can go out for Italian, indulge in Chinese takeout, and dine at The Cheesecake Factory (with the help of the FEED YOUR FACE Restaurant Guide). Because you do have the power to change your skin. All you have to do is eat. Dr. Jessica Wu is a graduate of Harvard Medical School, an Assistant Clinical Professor at USC Medical School, and a board-certified dermatologist. When she's not helping Hollywood's A-list get red-carpet ready, she's dishing up advice as the Skin and Beauty Expert on EverydayHealth.com, and spilling skin care secrets on national television shows such as "The Doctors, Good Morning America, Entertainment Tonight," and E! Entertainment Television. She lives in Los Angeles with her husband. "The key to looking younger - as I have learned from Dr. Wu - isn't copious amounts of Botox or even plastic surgery, it's a diet that will improve your skin from the inside out, as her Feed Your Face Diet has done for me. My skin looks radiant, smooth, and ten years younger." - Maria Bello, actress "Dermatologist-to-the-stars Wu's first book is packed with helpful tips. 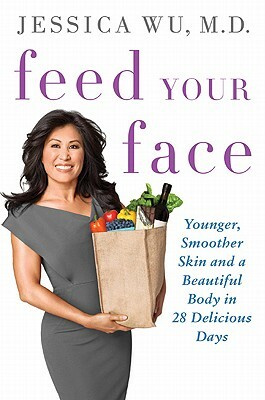 Dense but highly readable, the tome is split into four sections: a look at our largest organ, the skin; a guide to skin disorders accompanied by Wu's insights into foods both helpful and harmful for treating them; four weeks' worth of menu suggestions; and a quickie primer to homemade skincare products. Wu also includes a guide to Botox and other small-scale surgical interventions. The author is refreshingly honest and approachable. She enjoys having a tan, for instance, and doesn't see the point in telling her patients to wear long sleeves outdoors at any hour of the day. Though urging readers to eat organic, minimally-processed food is hardly a breakthrough, Wu's case for doing so is well-explained and easy to implement. The calm, sensible approach she takes here will be appreciated by anyone in search of perfect--or at least better--skin."